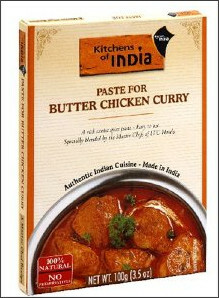 Remember how I told you that I'd let you know when there's an awesome deal on Kitchens of India Butter Chicken Curry?! Well, today's the day! This dish is super easy & super good! Right now you can get Kitchens of India Paste for Butter Chicken Curry, 3.5-Ounce Boxes (Pack of 6) from Amazon for as low as $6.93! Just sign up for Subscribe & Save to save an additional 15% (you can cancel it later). Shipping is FREE with Amazon Prime. You can also find the Kitchens of India Curry Paste Variety Pack, 3.5 Ounce Boxes (Pack of 6) for only $6.93 too (after signing up for Subscribe & Save)!